The Success Coach Network: Are You Spamming Yourself? I recently found a message from myself in my spam folder? It had never occurred to me that I could spam myself. I then stopped and asked myself how else might I be spamming myself? What kind of preprogrammed garbage have I allowed to be stored on my mental hard drive? Some words are so apropos. When I was growing up in the 60’s and 70’s, spam was this slimy meat like stuff in can. I can eat almost anything but spam is not one of them. Today spam is that flood of unwanted, slimy stuff that someone else wants to dump on us. What kind of mental spam do you have running around in your head that doesn’t need to be there? 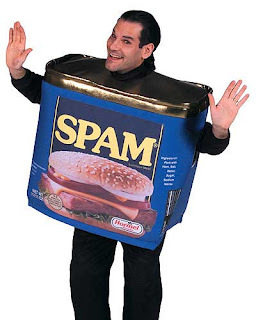 Spam, in and of itself, is not necessarily bad. What make it bad is that it is not something you want. Someone else is arbitrarily imposing their agenda on you. If you haven’t clearly defined your own agenda you will by default have little choice but to accept someone else’s agenda for you. The best defense against head spam is to get clear about who you are at your core and then align your conduct or behavior with that identity.